I watch a lot of youtube. Recently, since my computer is quite old and out of date I can’t update a lot of my software and this includes my internet browser. As a result, I can’t use adblock any more, and watching youtube has reintroduced me to all manner of innocuous 15 second advertisements. A good number of these ads are for Geico and feature their talking pig spokes-animal, Maxwell. At first, I would just overlook these preload videos or mute the sound. But I started to look at them a little bit more closely as of late – mostly because of their growing frequency in my viewing. There’s something strangely suggestive in their presentation, and specifically in the ways in which they treat the user/consumer of their product as a transient non-human object. I don’t have car insurance, and have never owned a car. I learned to drive stick shift on a 1983 gray, boxy, beautiful volvo station wagon. I loved driving that car. It’s six-cylinder engine was a powerhouse, and the way it would cruise down hills when put out of gear is a warm memory that I’ll carry with me for many years. I drove the hell out of that car, often over extending the transmission as traffic lights turned from red to green, jumping gears from first to third to impress my friends. I heard once that Volvos made before 1985 were incredibly heavy and unbelievably sturdy due to the fact that they were made from recycled tank parts. I have no evidence to support this rumor, but driving that car certainly made me think it was true. Still in all, I didn’t own the Volvo, and as a teenager I didn’t pay my portion of the Geico insurance I had as part of my parents plan. Since then, I haven’t had a car, and haven’t had insurance. Although I have other monthly bills, and have recently taken on (semi)regular health-insurance, I’ve never quite known what the affect of owning car insurance feels like. In some ways not being the target audience or market of these Geico ads has made me think about the context of how these ads might be appealing – or else consider the overall affect of their presentation. I’m beginning to speculate that the appeal is more than identifying with the base-line humor of a talking pig spreading the gospel of Geico’s mobile app. Instead, I started seeing how Maxwell serves as a symbolic substitute for the kind of consumer that would best benefit from Geico’s services. 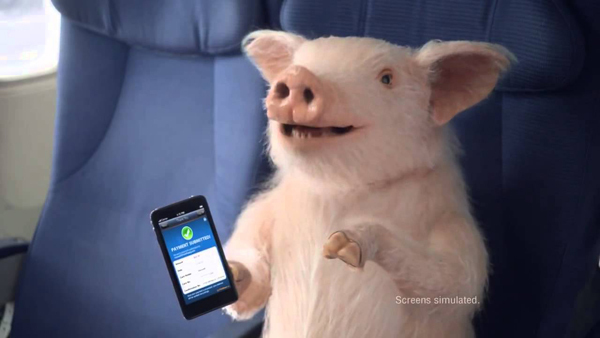 One could speculate how/why whatever ad agency thought it’d be a good idea to suggest that Geico’s customers were equivalent to farm animals, but I think the more important question revolves around the scenarios in which the pig finds itself. Over the series of ads we find the spokes-animal in a variety of different contexts that allude to the pig’s upper-middle-class life style. We find Maxwell sitting comfortably in the business class sections of an airplane, pool-side on vacation, doing yoga during the day, and enjoying casual car rides through suburban tree-lined streets. All these locations become a series of snapshots of a life-style that Geico affords (or promises). Though each scenario on its own serves as a kind of one-liner, together they create a portrait of an animal whose thrifty savings on car insurance have added up to a life of leisure. The synecdoche of Geico’s product for middle-class ideals is pushed through the way the ads employ a film strategy that Deleuze has called any-space-whatever. This filmic strategy – most notably used by Ozu and Bresson – treats the space of a scene as a site of disposable “virtual conjunction.” The location, whether airplane or resort hotel, is a subtle and strange location of specific anonymity. It is not a universal space, but instead a “singular space, which has merely lost its homogeneity, that is, the principle of its metric relations or the connection of its own parts.” Although the site itself is a transient location – or one of relative insignificance – its meaning has been radically redefined to have particular affect. The site becomes a “potentiality” according to Deleuze. That potentiality of creating affective meaning is not created in the isolated location itself, but in the aggregate of locations that the pig traverses. In this way, the meaning and significance of the character is only fully portrayed when we – as audiences and affected-individuals – assemble the parts. The collective montage of Maxwell’s life – once compiled – is an aspirational desire of the consumer. As an individual so far removed from being a potential Geico customer, the way that Maxwell’s identity has been shaped by its consumer-knowledge over a series of any-place-whatever scenarios to be a telling and fascinating experiment in moving-image semiotics. This is particularly the case since the affect of driving itself seems all but lost in these ads (except in early appearances). The vivid memory of careening down hills and skipping gears of my old Volvo seem in direct opposition to the methodology of ads designed to accommodate an anthropomorphic transient traveler. On this past Wednesday, I drove up to Vermont in a borrowed stick-shift station wagon. 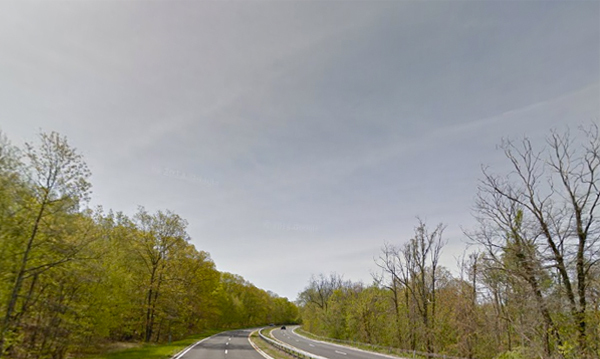 The bulk of the four hour drive from NYC is on the Taconic Parkway, a scenic stretch of blacktop that runs over 100 miles north and south along the eastern edge of the state. The drive – which I did solo – put me in the state of mind that often happens during extended car trips: contemplative silence. During the trip I thought of many things: people both close and distant, places near and far, and times recent and past. The drive, like many I’ve done before, served as a kind of escape – a lapse of thinking about day-to-day worries which inevitably leaves the mind open to wander. I tend to immensely enjoy these rare moments and the drive on the Taconic was no exception. Although on the first stretch of the parkway I started with more immediate moments, I quickly started to work backwards in time on trips that I had just taken. I thought of a recent anxiety filled impulsive train trip south, and sun-soaked cross-brooklyn sweaty bike rides. Somewhat morbidly, I thought of the different kinds of close encounters that I had within these modes of transportation. On bike, I ride without a helmet and often dodge taxis that make sudden turns into my lane without looking. The train, however, held more physiological dangers. Due to an intense depression, I desperately thought I needed to get away in a hurry, but realized I didn’t know where I was going. These different trips and their flavors of recklessness made me think of how I’d never been in a serious car wreck. My luck in this regard made me recollect the many people I know who have be victims of unfortunate accidents. Luckily I didn’t dwell on these morose thoughts, and instead moved on to other, more fond, memories. The drive on this winding, fairly narrow, and often cracked two-lane road reminded me of car trips I would take as a child with my family to Skyline Drive in Shenandoah National Park. Although the Skyline was designated a National Scenic Parkway (unlike the Taconic), the atmosphere of the Blue Ridge mountains could be felt in the foothills of the Berkshires. The long, old, rolling hills that the Taconic winds through took me back to the time when I sat in the backseat with my brother listening to cassette tapes of Elton John. We would play car games and do madlibs – a tradition in my family that still lives on during holidays. Those trips, and the hills that surrounded me on this drive, reminded me of other automotive adventures across the country. I thought of driving through Nebraska on my way toward the continental divide. I remembered the first time I approached the staggering cliff faces of the “fourteen-ers” and how different the mountains of the east coast are from the craggy Rockies. Those mountains always felt oppressive to me, like daggers of rock cleaving the earth. My experience of the bare flatirons was always uninviting, as if the force of their protrusions had created a barrier for greenery to blossom. I tend to think The reason why these jagged stones are called cliff faces is because they stare at you from all directions, like a haunted portrait of an elder statesmen. The only was to escape their glare is to turn away, but even still you can feel the chilling breeze coming off of them on your back, like a glacial whisper calling you a coward. My sourness for that terrain turned to more pleasant reminders of the people I got to know during my two and half years I spent in the Denver/Boulder area. I thought of the people that still lived out there, and the friends that had recently moved to New York. I thought of how life in that part of the world moved a bit slower. I distinctly remember in the first week moving there being asked “what’s your hurry?” over a dozen times. The pace grew on me, though, as I settled into life amongst the flatirons. As I drove onwards upstate, I thought about the ways that time and distance operated on such strange and different scales depending on where you lived. For instance, I thought about how getting to Denver from Boulder would take roughly 45 minuets and how the same amount of time could be taken by just getting to Midtown on the M Train. This same increment of time would be spent getting to and from work when I lived in Chicago – though at that time I would be taking the bus and not the subway. Strangely enough, as I was thinking about this the GPS told me I had 45 minuets left until I arrived at my destination. It struck me in that moment, particularly since I was eager to get off the road and how 45 minuets seemed like a long time. But prior to that moment and throughout my trip thoughts of people floated into focus. I thought of emails and postcards that I wanted to send to friends, or correspondences that I had neglected and wanted to rekindle. While remembering old faces or distance acquaintances, I recalled the places where I had made formidable relationships. There were houses and hovels, living rooms and backyards, bedrooms and rooftops that all fumbled around in my mind while I sat behind the steering wheel. I remembered parties and meet ups, formal gatherings and bar crawls, all-nighters and quiet mornings. A myriad of emotions also came with these past encounters: embarrassment and intimacy, pride and loss, affection and hostility, worry and calm. The drive, though physically isolated along the patchwork pavement of the Taconic, mentally took me on another journey way off the highway – guiding me aimlessly along a road I had traveled over the course of many years. As I ventured along this mental roadway, some guardrails and signposts could’ve been built, but then the overall view would’ve been distorted and obscured. Instead, the road lent itself to vistas and reflections, at times precarious, but for the most part rewarding. Thus the drive went on, and I continued to ruminate on a variety of things as I got off the Taconic around Hoosick. As I neared my temporary home for the next week, I came back to the present, to the thoughts of the work that lay ahead and the projects I hoped to see through. Upon my arrival, I gathered my bags from the car and noticed that – although my body was tired from the drive – the weight of their burden seemed lighter than when I had left that morning. Recently, as I’ve been walking and riding around the border between Bushwick and Bed-Stuy I’ve been struck with the amount of Notorious BIG that has been playing all around me. Growing up on St. James Place, Christopher Wallace would frequent the stoops and street-corners a stone’s throw from some of my own frequent haunts. And although the knowledge of this has been somewhat in the back on my mind, I’ve been reminded of it more recently as the frequency of his lyrics have been filling the burgeoning summer air. This is not to say that my current proximity to Wallace’s boyhood somehow connects us spiritually. But the rapidness with which Bushwick, Bed-Stuy, and Clinton Hill are changing and becoming more gentrified has given me more pause to consider the ways in which Biggie’s music still resonates with the spirit of the neighborhood. But this common rags to riches narrative that pervades of lot of mid-90s rap is not really what keeps Biggies voice strong along Dekalb Ave where I bike almost everyday. Part of this narrative involves a hope and an openness that rarely seems fitting for a hard voice from the inner city. Wallace’s willingness to expose personal flaws, doubts, combined with the introspective knowledge of performing the “stereotype(s) of black male misunderstood,” mark him as a unique voice that is still needed within Brooklyn. That introspection is something that I feel is missing within the Bushwick just to my north. Although a frequent conversation about the current state of artists housing within the neighborhood involves gentrification, displacement, and wealth inequity, a willingness to talk about self-implication and culpability seems to sour most. Though this self-reflectivity doesn’t dwell on what went wrong, or brood on voices from a former era can cloud the judgement and the progress of an individual (or community). Though hardships are acknowledged, Wallace shrugs off the problems of the past through reiterating “But it’s all good” throughout the track. Though this acquiescence is in some part due to Biggie’s fame, the dismissal can also be attributed to Big’s desire to look at the now in favor of living in the past. In this way, the neighborhood – or those like myself that have recently moved to the area – seem so captivated and stunted by the rapid change they’ve noticed – reflecting on what used to be more than what is happening now. Again, I don’t know if this is why I think hear Biggie more now that I have in recent years, but I think that his music – particularly Juicy rings out link an anthem for the neighborhood to consider what’s currently at stake in the seemingly inevitable change to come. As I’ve been hearing Wallace’s baritone rhymes bounce from the trunks of car stereo systems, I’ve been thinking of the way Rebecca Solnit describes listening to country music while driving her car in the desert. Being present in the landscape and place of an artists past radically changes the ways one relates to their music. The visuals of their lyrics come to life before your eyes, the metaphors become more tangible, their lamentations more felt. As I hear the bass line from Get Money coming from the windows of the houses along Gates Ave, I can’t help but think of the ways in which Biggie’s music still paves the changing streets of this neighborhood. 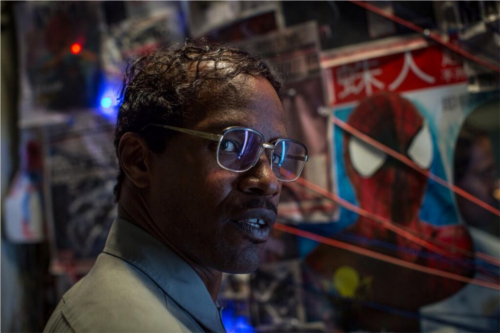 I recently saw Spider Man 2 at Williamsburg Theathers in 3D and couldn’t resist making comparisons between the character development of Max Dillon / Electro and the central character in Ralph Ellison’s The Invisible Man. There are notable scenes in which the artistic direction of Max’s apartment – prior to his transformation into pure energy – borrows and/or references the photographic representation of Ellison’s character as depicted by Jeff Wall. Bare light bulbs hang from the ceiling, mind maps are pinned up everywhere, and the interior seems not quite unkempt, but rather maniacally organized. Early on in the movie, we’re introduced to Max as an individual often overlooked or else oppressed by the clamor of the city. For example, although Max’s research and engineering projects have been instrumental in the implementation of a new super-sustainable power-grid for the NYC of Marvel’s universe, he is not invited by his colleagues and superiors to reap any of the financial compensation or personal recognition (side note: a notable cameo happens in this development by super villain Alistair Smythe). As we see Max develop, we notice a pattern of being repeated beaten down, disrespected, and turned into a generally disenfranchised individual that only finds pleasure in fantasy. Although Max’s disenfranchisement occurs earlier in the film, it wasn’t until a later scene staged in Max’s apartment that I started to make the Invisible Man comparison. The visual reference to Wall’s photograph led me to start to think about the other kinds of similarities that Dillon and Ellison’s narrator might have. As a result, I felt as thought the disenfranchisement of black citizens in America and the political aggression that arises from this oppression to be strangely invoked in the artistic direction within the movie. Stranger still, in my opinion, is the ways in which racially driven oppression and power dynamics are applied to Max Dillon as a black character in this film. In comic books, Electro is previously always depicted as white and his origin story does not typically involve the level of disenfranchisement that is represented in the film. Dillon had not only never been represented as a disenfranchised minority, but his super villain activities never revolved around gaining political leverage or more generally showcasing generic power. Thus the character plot line of Dillon’s development in this iteration is radically rewritten to rely on thinly veiled racially driven aggression/oppression. The racial undertones are further complicated – or exacerbated – when Dillon is captured and tortured in Ravencroft Institute, only to be released and freed by a white emancipator Harry Osborne. After his release, Dillon swears allegiance to Osborne almost too easily, ultimately trading his initial disenfranchisement for servitude. I don’t really know how to further discuss the problematics presented by Dillon’s depiction, and the ways in which his character aesthetically borrows from the narrative of the Invisible Man, but I couldn’t resist drawing some equivalences. Whether the intention is deliberate or not on the part of filmmaker the similarities – and subsequent discrepancies – between the two compelled me to give it a bit of further thought. After the opening of Movement Materials and What Can We Do, Andrew Norman Wilson‘s solo show at Prairie Productions, several of the conceptual and physical territories explored in the short run show have continued to resonate past its closing last week. 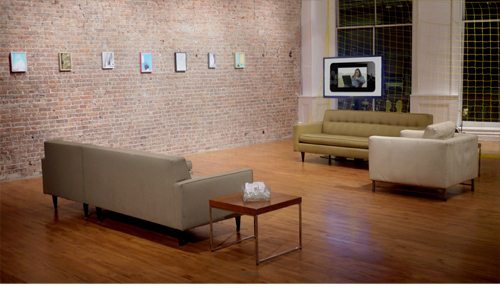 The premise of the show operated as a consolidation of previous online projects and videos into a more tangible manifestation organized as a gesture to bring these topics away from their digital origins. In doing so, previous works like Scan Ops and Workers Leaving the Googleplex gain more weight in introducing a physical element to discuss the so-called dramas of digital production through illustrating their history and cultural lineage. 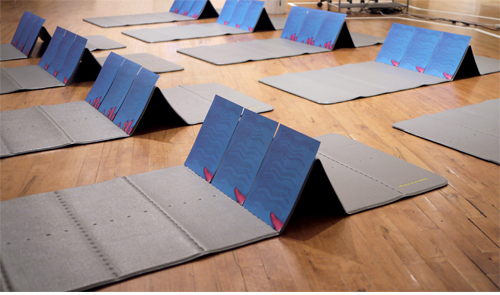 The show consists of multiple installations of various “viewing stations” and “mediation environments” that mimic other previous work, but are designed more specifically to be “ideal spaces” for the listening and contemplation of a lecture-performance that Wilson performed during the opening. The space serves as a transitional site akin to other familiar topics in Wilson’s oeuvre – the airport, the commuter spa, the temporary architecture of a corporate office life style, etc. There are also new works featured in this show that delicately explore the nuances of digital labor and the potential for this type of unskilled-labor to be greatly – and disturbingly – taken for granted amongst cyberspace users, surfers, and specifically scholars. To a certain degree, the academy itself is implicated in this process of unintentional (or at least unconscious) sidelining of digital laborers, a tricky territory given the self-implication that Wilson imposes in previous work. In avoiding the tired game of “who is to blame” that typically occurs in art work that hovers around social practice, Wilson fractures and rearticulates the rhetorical motifs of the corporate world in order to use their inherent – and again, unconscious – poetics to evaluate and critique an international corporate engine. More specifically, the lecture performed during the opening floats between essay film – a genre familiar to Wilson who has cited the recently deceased Chris Marker as one of his primary influences – and musings on the phenomenological linkages between himself as artist-laborer and the digital-workers represented in his work. These conjectures also reflect on the nature of the technology that binds us together as users, viewers, operators, and laborers (whether conscious or not). The danger here comes with an all-too-easy transcendental approach to how the “internet connects us together in ways never imagined possible.” However, Wilson adapts that cliché to assist in how alienating the infrastructure of the web is to its end users. Through our connections (both as art audience members and as digital consumers), we can start to witness a dangerous tendency within digital media to usurp and obliterate its predecessor for the sake of a (broken) mythic, and often politically corrupt, progress. Through guiding our vision with our listening to Wilson’s lecture, audiences are made to reconsider what we mean by immaterial, since the labor, the handiwork, and the infrastructure of the web necessitate physical properties and units; this includes a spectrum of physicality that span from the electricity that flows through fiber-optic cabling as well as the fingertips that hold down photographed pages for GoogleBooks. Wilson repeatedly reminds us that the immateriality of the web is a precarious assumption on the part of digital practitioners and consumers. The effectiveness of this warning is enhanced when positioned amidst a visual landscape where such ignorance has run rampant, where even clearly physical objects like yoga mats, inflatable exercise balls, and ergonomic office furniture could be viewed as immaterial. Wilson debuted a work-in-progress video piece titled Free which seemed to present uncertainty and precariousness across personal, professional, and civil dimensions. For one section – ‘The School,’ Wilson hired a corporate video team to shoot scenes in which a Korean student from Benito Juarez high-school uncertainly reads text from motivational posters around his school. For another section – which Wilson dubs ‘The Corporation’ – former Google contract laborers (like those represented in Googleplex) present their hobbies around silicon valley – trance DJing, Ninja-performance, and go-ped racing to name a few. The participants spoke about the future as if it were the present, summoning up a rhetoric of futurity akin to utopian discourse. Each section seemed to contain elements that could fit in other categories, and this was acknowledged by an opening PowerPoint-generated animation of ten different exploding tables of contents. A gesture that perhaps means to literally tear apart the vernaculars that typically divide these sectors of Western Culture. 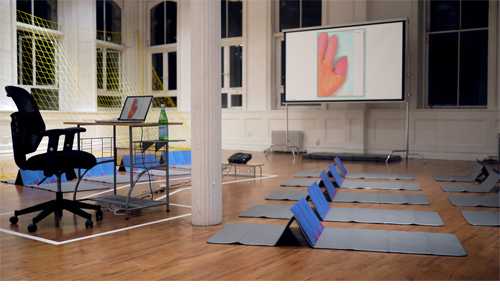 As an artist that has had his fair share of working in the IT industry, Wilson has unique insights into the inner workings of the giants in that economy, and through partial self-exploitation, he is able to address a somewhat diaristic redemption of his involvement and active participation with this act of labor marginality. Wilson remains refreshing in his self-awareness not only as a voice and actor within this world, but also more importantly in his physical demeanor while performing. Through his unapologetic groomed behavior, it’s easy to imagine his as a corporate lackey, or even as an a spokeperson/protegee of Elon Musk. As the blurring of the lines between self-promotion and artist as brand become more obfuscated and abstracted, Wilson appears totally conscientious of his towing the line, and seems to have more recently decided to work within the rhetoric of corporate infrastructure, than to tip-toe around it. In some ways, this show brings to the fore this willingness, and although some of that is pronounced more readily in previous works, the translation of that energy into more expansive and less “branded” territories– ala the new video Free – shows a burgeoning maturity on the part of the artist.